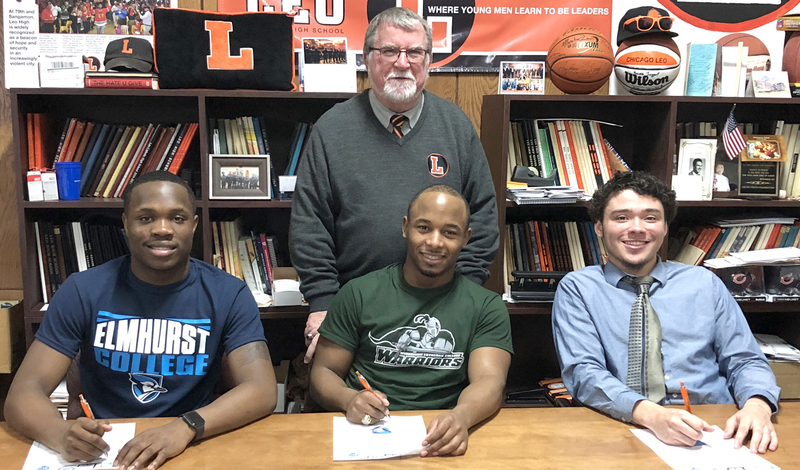 Congratulations to (left to right) Myles Thomas, Jalen Harris and Jonathan Randle, Leo seniors who signed letters-of-intent to continue their athletic careers in college on Thursday, March 21 as school President Dan McGrath looked on. Thomas, who helped the Lions to a 24-9 record with regional and sectional titles this season, will play basketball at Elmhurst College. Harris, the second leading ground gainer for the Leo football team, will play football and run track at Wisconsin Lutheran University. Randle, the No. 1 pitcher for the Lions’ baseball team the last two seasons, will pitch for Harper College. When football standout Darryl Ousley-Parr and basketball All-Stater DaChaun Anderson sign their letters later this month, Leo will have 10 scholarship student-athletes in the Class of 2019—not bad for a school our size. It’s worth reiterating that Leo is a school of opportunity.